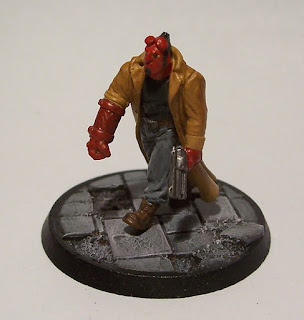 Finally got around to doing the Hellboy conversion of a Hasslefree Harby, standing nicely on a Fenris base. Well I know everyone seems to have done one of these, but I had to give it a go eventually. Another nice paint job very clean. Bases look really good where did you get them? The bases are all from Fenris games (http://www.fenrisgames.com/). Nice variety and good quality from what I've seen so far. I picked up a few different selections last week to try out.